Lawrence Norfolk. Henry Holt, New York 1997. 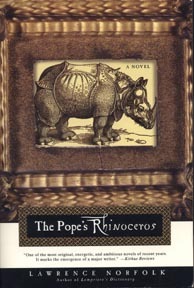 A wildly funny, picaresque novel, based on one of historys most bizqarre chapters: the attempt in the sixteenth century to produce a rhinoceros as a bribe for pope Leo X. An inventive historical novel that uses an absolutely outrageous bit of history to explore the obsessions and corruption of the Renaissance. That Norfolks novel is based on fact simply makes his point that much funnier — and more painful. He has a flair for rich characters, including in The Popes Rhinoceros an ex-mercenary soldier who can talk and manuver his way out of any calaminity, and a host of corrupt priests, cardinals, ambassadors, courtesans, and nobles. The author Lawrence Norfolk is a little-known British novelist whose first novel, Lemprieres Dictionary, was published in 1992 to considerable critical acclaim. This is his second novel, and I will anxiously await his third.